Banners for state championships for the Sayreville War Memorial High School football team are lined up on a sign along Main Street in Sayreville, N.J., Saturday, Oct. 11, 2014. SAYREVILLE, N.J. — The coach of the New Jersey high school football program that had its season canceled amid hazing and sexual assault allegations won't be back on the sideline this year. 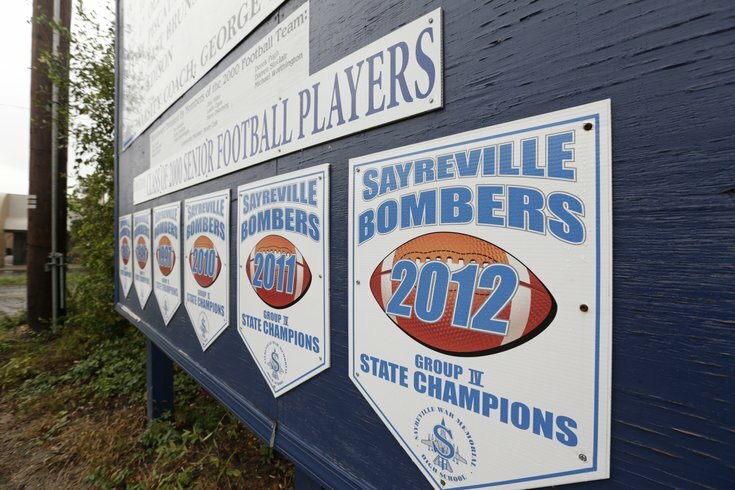 Sayreville Public Schools on Thursday posted the position of head coach, which was held by George Najjar. "Today we took the next important step toward the 2015 football season. We are excited to launch a new comprehensive search to find the next leader of our football program," Superintendent Richard Labbe said in a statement. Najjar remains suspended indefinitely with pay from his tenured physical education teaching position. Labbe wasn't immediately available to discuss Najjar's future as a teacher in the district. School board president Mike Macagnone said that he supports Labbe's position "wholeheartedly." "Dr. Labbe's position has been very clear and unambiguous: Football will be played in the fall and the team will be under new management," Macagnone said in an email. The board president declined further comment and it wasn't immediately known when the district decided to hire a new coach. Najjar compiled a 165-54 record during 20 seasons at Sayreville, including going 21-13 in postseason play. More than 1,000 people have signed a petition to support Najjar, who was inducted last year into the New Jersey Football Coaches Association Hall of Fame. Labbe canceled a scheduled game on Oct. 2 after receiving information from the prosecutor's office, and canceled the rest of the season the following week. Najjar and four assistants were suspended in October at an emotional school board meeting, where numerous current and former players gave statements in support of the coach, who has built the school's football program into a regional power. Najjar wasn't immediately available for comment Thursday. None of the coaches have been charged, and the assistants were reinstated a month later. "The only reason I experienced any success, aside from my family, is because of Coach Najjar," said Brandon Hoyte, a Sayreville graduate who went on to star at Notre Dame and play briefly in the NFL.